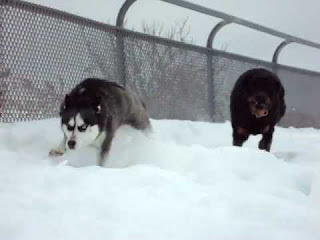 Rottweiler and Husky love snow ! Rottweiler and Husky are both dog breeds that absolutely love snow. Everybody knows that Huskies are dogs that are somehow built to love cold weather, but only a few know that Rottweilers absolutely love cold weather too. These two dogs in the video that is shown on youtube love the snow so much they can't wait to go out and play on snow. Feel free to let your dogs play in the snow when it is not too cold just as these dogs in the video who act like little puppies and play when ever they get a chance, just make sure that their feet are wiped off and no ice accumulates between their toes.